Scott Harvey Wines, founded by veteran winemaker Scott Harvey and his longtime wine industry wife, Jana, celebrates the 10th anniversary of their wine business with festivities in Napa Valley, a look back at how he built his winemaking style, and a look forward to continued commitment and dedication. Scott Harvey Wines (http://scottharveywines.com), founded by veteran winemaker Scott Harvey and his longtime wine industry wife, Jana, is celebrating the 10th anniversary of their wine business with festivities in Napa Valley, a look back at how he built his winemaking style, and a look forward to continued commitment and dedication. Wine Club Members and fans of Scott Harvey Wines are being treated to festivities and special events. 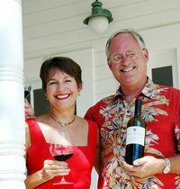 Festivities for the 10th Anniversary Event will kick off on Saturday, July 12th at Scott and Jana Harvey’s home in St. Helena. Wine Club members and longtime supporters of Scott Harvey Wines are already requesting invitations for the celebration. Guests will compete for prizes in showing off their knowledge of how the wine business has progressed in the past 10 years since the founding of Scott Harvey Wines. VIP tickets include a signed commemorative Scott Harvey magnum of Barbera or Reserve Bottle of Scott Harvey Wines Zinfandel. In an unusual twist, said Jana Harvey, President, “we are reaching out to Scott Harveys around the world to come to Napa and help celebrate with us. (There are 543 Scott Harveys in the United States!) 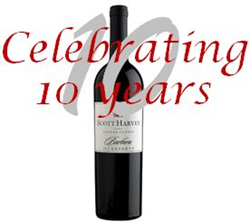 People always love seeing their name on our wine labels, and this is a perfect opportunity to take part in the fun.” A special 10th Anniversary Event package is being offered for anyone named Scott Harvey, and a new LinkedIn Group, ‘Scott Harvey Worldwide,’ is giving Scott Harveys a place to connect. The Scott Harvey Tasting Room, a cornerstone of Main Street in Amador County’s Sutter Creek, plans to celebrate the milestone later this summer. Scott Harvey’s winemaking career dates back long before the launch of Scott Harvey Wines. Initially trained in Germany, Scott immersed himself in the Old World style of Winemaking. In 1996, Scott was recruited as Partner, Winemaker & President for newly purchased, Folie à Deux Winery in Napa Valley. Combining forces with renowned Winemaker, Richard Peterson, Ph.D, a formidable winemaking team was launched. Scott pursued his commitment to award-winning Cabernets made from the Estate Vineyards in Napa Valley while continuing his passion for Amador County Zinfandel. Access to Scott’s original Grandpère vineyard in Amador County and close relationships with premier Amador County growers, resulted in award-winning wines for Folie à Deux. In addition, Scott’s creation, the “Menage à Trois” line of wines, was a commercial success. In 2004, Folie à Deux, now a respected brand, was sold to Sutter Home/Trinchero Winery. Scott was ready to start his own venture, and he had the ideal partner – his wife, Jana, a wine industry veteran. Looking to the future, Scott plans to continue his dedication to being a leader in bringing Old World style wines back to the forefront of California winemaking.